If you’ve done your homework, you realize that you can actually make your home work for you! 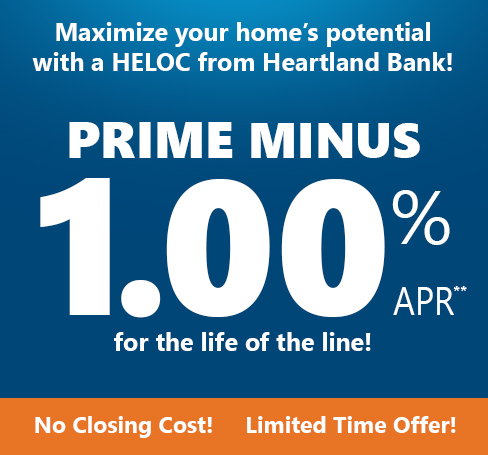 At Heartland Bank, we can help you with a Home Equity Loan or Line of Credit that would enable you to borrow against the equity in your home for such things as home renovations or repairs, debt consolidation, vacation or medical expenses. A Heartland Bank Equity Loan may be your solution as you research options to meet your specific financing need. This option allows you to use the equity in your home rather than other higher interest products. A Home Equity Line of Credit from Heartland Bank allows you to borrow against the equity in your home with the flexibility and ease of using your approved funds up to the limit, making payments against the balance, then using the available funds again as needed. **Annual Percentage Rate (APR). This is a variable rate that will adjust to the Prime Rate as published in the Wall Street Journal on the last day of the month, currently at 5.50% as of 04/08/2019. If the Prime Rate changes, your interest rate and payment will adjust accordingly. A balloon payment may result, if applicable. Maximum interest rate is 24%. These rates are available to applicants with a minimum credit score of 725 and a maximum loan-to-value of 80%. Floor rate is equal to initial rate at time of closing. Your rate may also be different depending upon your credit history. Maximum line amount is $500,000. Loan term is ten years. Initial draw of at least $10,000 is required. Payment needs to be auto-deducted from a Heartland Bank checking account. Draws and payments can be made during the entire term of the loan. Lines over $250,000 in first lien position may require title insurance. Minimum monthly payment for a HELOC is $100 or the balance owed if it’s less than $100. Monthly payment is 1% of the principal balance at the time it bills each month, so it will fluctuate month to month. There is an annual fee of $50.00 that is waived the first year, and is applicable every year thereafter. Property insurance is required. Flood insurance may be required. 1-4 family owner occupied properties only. Property must not be currently listed for sale. Maximum debt-to-income ratio of 40%. This offer is valid for new equity lines only. Subject to credit approval and appraisal. Consult a tax advisor about the deductibility of interest. Other rates and terms available. *** Offer ends 05/31/2019.